Still can't justify an SSD? Corsair hopes to coax the cash out of your coin purse with its new Accelerator line, which aims to shatter your HDD speeds but not your bank account. The Accelerator series combines low-capacity flash drives with NVELO's Dataplex caching software for a hybrid storage solution. 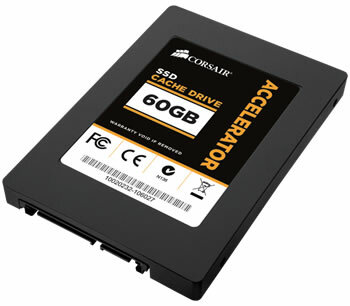 Frugal enthusiasts can install an Accelerator to achieve SSD-like speeds without the full expense or hassle. The only difference between the SF-2141 and the SF-2181 is that SF-2181 supports up to 8 channels whereas SF-2141 is limited to 4 channels. Using SF-2141 in the 30GB model is logical because it consists of four 8GiB dies and hence only four channels can be populated. As for the 45GB model, it uses six out of the 8 channels to achieve a raw NAND capacity of 48GiB (6 x 8GiB). Besides having a lower admission fee than, say, Intel's 520 series, the Accelerator drives require less effort to configure: just pop the drive in your machine and install the Dataplex software. You don't have to reinstall Windows or clone your existing drive. The Accelerator just aids your primary drive by caching data. It's unclear how much of a boost you can expect on average, but Corsair touts a fivefold increase. Based on results from similar products such as OCZ's Synapse, a twofold bump isn't uncommon during select real world tests, though that particular drive has about double the Accelerator's quoted read and write rates. If that has any bearing on the results, the 60GB Accelerator might be in a tight spot with the 64GB Synapse price identically at around $99. The 64GB Crucial m4 is even cheaper, but it lacks Dataplex.